Books into V class, for which there is easy availability. Upgradeable, and you can upgrade all the way LIS-EWR-IAH-GIG with one single GPU. Most interestingly, fare allows one free stopover in the US, and one additional stopover for $100. If you were planing on traveling LIS-EWR-LIS, might as well do a EWR-IAH-GIG weekend add-on, and the whole thing will be cheaper than just LIS-EWR-LIS. With the free stopover the taxes go up a notch, so you might be at €734, but still a great deal. Wow, outstanding find for a V fare. My last TATL W was over $1500 usd from US! UA V earns 100% on A3. 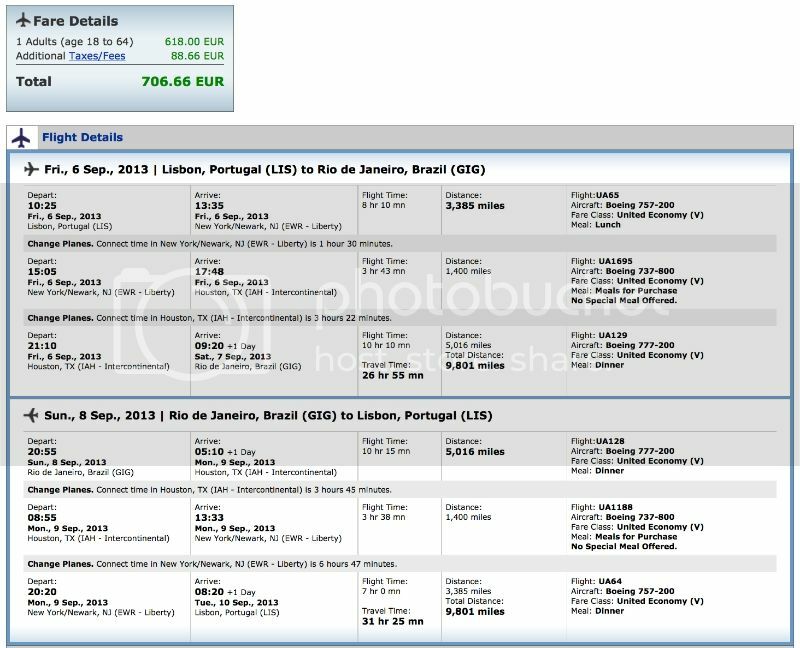 This could be instant *G status for 3 years with one €706 trip. Great fare, but keep in mind the cost of the Brazilian visa. The cost for most European citizens (and citizens of dozens of other countries) is zero - no visa required for tourism visits up to 90 days. Yes, I'm posting for those (few ) among us from the other side of the pond. Question: I have to clear immigration at EWR to board the domestic flight to Houston and clear immigration again for the international flight to GIG? And likewise for the return sector? Programs: UA Plat (1MM), AA Plat, HH Diamond, MR Plat, Hyatt Diamond, SPG Plat. It seems in Brazil, Argentina or Chile, US citizens pay the heftiest fees. Am I right to say that one needs to clear immigration at EWR and clear immigration again at IAH? On the way there at EWR, on the way back at IAH, if that's how you're routing. I-94 has gone paperless (automated they call it). You don't need to fill out the form anymore. Wouldn't I need to clear arrival immigration at EWR and clear Departure immigration at IAH? Do you think the answer to that changes by the hour? There's really not much of departure immigration in the US.